Scratches and fading are normal on kitchen cabinets. If you like the style of your cabinets and they’re still in great shape, then a solid sanding and a fresh coat of paint may be all that’s needed. This simple cosmetic update will give dated and worn out cabinets a whole new look. White cabinets offer a fresh and airy feel to an otherwise drab space. Select a colour that complements your kitchen’s overall aesthetic and one that won’t clash with countertops. Cabinets from decades past get a quick revamp with new, modern hardware. This subtle swap magically enhances the look and feel of a dated space. Chrome, brass and nickel are all popular selections. When choosing knobs and pulls, it’s advised to base your decision on your faucet and other finishes. This will tie the look together and make your kitchen pop. A lighting swap can make a big difference. 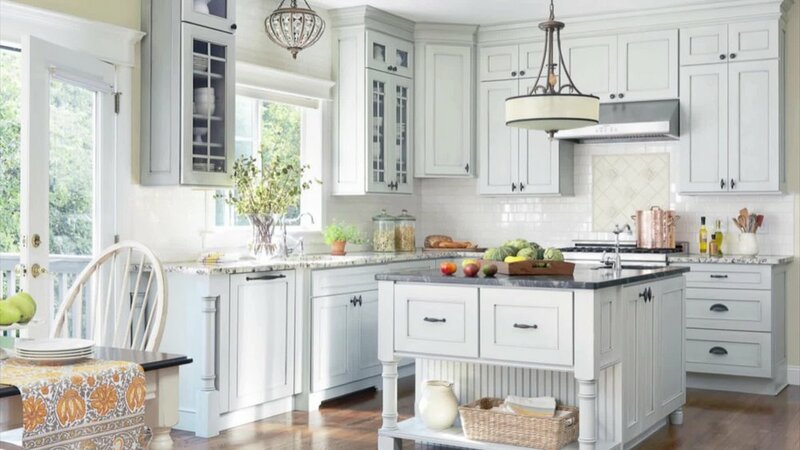 New pendants over the island, pot lights, and a focal fixture over the sink are all easy updates that bring your kitchen into the current century. The options are endless when it comes to lighting, so have fun selecting pieces that complement your space. Add visual appeal and ambiance with different lighting in different areas of the space. Too much stuff in the kitchen may be hindering the overall design of your space. Give dishes and Tupperware room to breathe by removing any random odds and ends from cabinets and countertops. This is not to say countertops should be bare. A kitchen should look lived in. Combine décor and function with interesting jars and jugs, that coveted red KitchenAid mixer, and large fruit bowls and bread baskets. This update is not for everyone, especially if you know exposed shelves will be in total disarray before the day’s end. Decorative bowls, copper mule mugs and old-school milk jugs are great options for exposed shelving. If you lack upper cabinets, a few reclaimed wood shelves with metal brackets is a quick and easy addition for those items in need of a home. If glass door fronts don’t fit the budget, consider removing upper cabinet doors. This simple kitchen revamp will increase the feeling of spaciousness. From simple and sleek to bold and intricate, the kitchen backsplash has become a work of art. Ceramic subway tiles are currently in high demand. This modern and durable addition comes in a variety of hues and sizes. Mixing different materials is also a fun way to add a unique detail to the space. A few quick fixes will make a world of difference in a dated kitchen. Have fun with the details and determine where to splurge and where to save.